It’s officially fall. And although we’ve only had a few days of true fall weather where it’s been wonderfully cool and crisp here in New Jersey, I am ready for the cool weather with some new Brooks gear (remember, we’re Brooks ambassadors). The Fall ’15 apparel that Kristen saw in Seattle has officially launched, so I got to try a top and bottom from the new collection. Ready, get set, go! 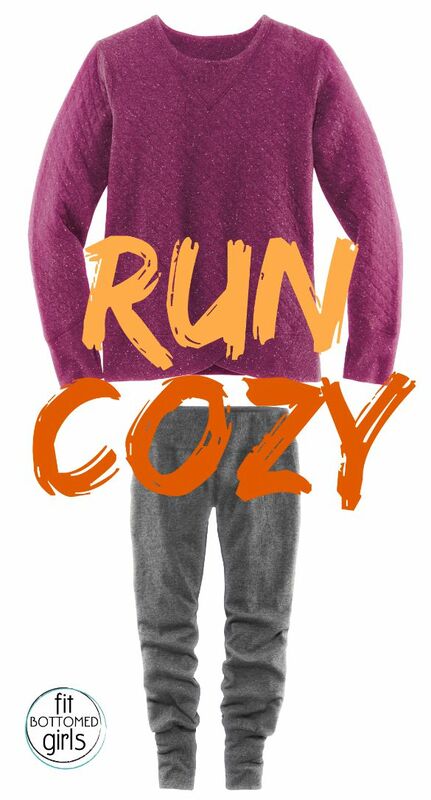 Th Fly-By Sweatshirt running shirt ($80) is super soft and comfortable and warm enough for crisp morning runs. It’s thicker than your usual running shirt with quilted details, so it’s best on cool days or as you’re warming up or cooling down. The speckled, quilted look give it a bit of a retro vibe, but with the modern twist of thumb holes and a petal hem. It’s also reversible, which is fun when you want to switch up your look. On my bottom half, I tried the Joyride Pant. With a dark heather gray look and DriLayer technology, you’ll look cool while you stay warm and dry. If running tights aren’t your thing, or you prefer to switch it up now and then, these pants will do the trick. The inner liner is super soft and smooth for wicking moisture, but they give you a looser fit. With a tighter hem around the ankle, you don’t have to worry about these slipping under your heel during a run — they stay put. The fit on these took some getting used to as they’re looser on the leg than at the ankle, but that also makes them insanely comfy and great for lounging when you’re not running. My favorite part is that they have true pockets on both sides, and not just a hidden pocket somewhere in the waistband.